There are self checking puzzle pieces 0-10. 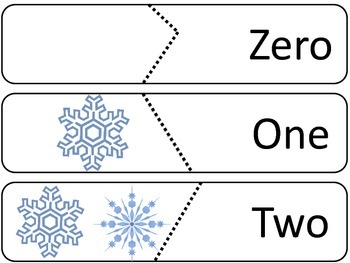 Match the number of snowflakes to the correct number or number word. 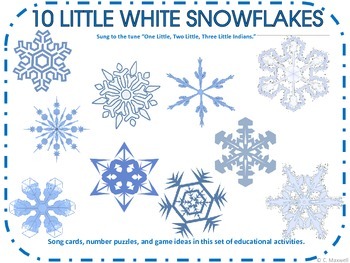 Several puzzle pieces say White Snowflakes for extra fun. The songs are sung to the tune of "One Little, Two Little, Three Little Indians." A song cards are included. One cards goes from 1 to 10 and the other card from 10-1. 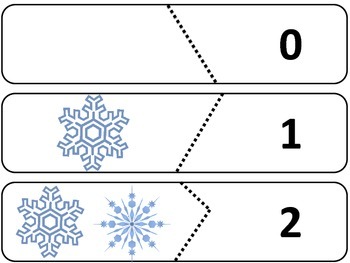 The 10 snowflakes can be made into props with popsicle or paint sticks attached. Magnets can also be stuck to the back to allow them to be attached to a magnetic surface. 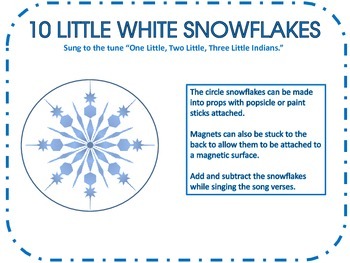 Add and subtract the snowflakes while singing the song verses. The instruction page has games to play using these pieces.This can be used with the whole class, small groups, or in centers. Plus, it can easily be adapted for the littlest learner by only using the numbers introduced. Download Preview to see the activity. Don’t have time to cut stuff out? You may have a valuable, untapped resource, in your student’s parents! Many parents work and are unable to help with activities or projects in the classroom. This is their time to shine! Simply send home the items after laminating, with directions about how you want them to be cut. They come back with both the student and parents proud to be involved in helping the teacher!